I am writing this piece with an annoying-chicken-shape-kitchen-timer ticking loud counting back besides my laptop ready to ring when the time is up. It ticks down for only 25 minutes. I feel as if I was running on a fast treadmill with a wide open crocodile mouth open waiting for me to trip and ready to send me to hell. So here is why I do this. This is the second and the third day of me trying to wake up at 4 O’clock at night for 7 days. It has been slowly sliding. The plan was to wake up at 4 o’clock in the morning. Instead, I woke up at 4:10 AM at the first day, 5:10 AM at the second day, and 6:00 AM at the third day. The first day of the four O’clock Project, I felt that I reclaim back my time from 12 hour a day to 24 hour a day. The problem is that I still think that I did not use it effective enough. I was trying to sit to write and it can go like this: Opening Evernote-> okay I need to read the previous post-> open Facebook -> “oh look a viral advertising of Hare and a bear” -> wow the music is nice what is it-> find handphone->open Shazam-> oh Lily Allen, somewhere Only we know -> who is the singer of the original version?-> go to Google-> ah Keane eh wait, i think this song also used in movie with Sandra Bullock and Keanu Reeves and so on en so forth . And it is exhausting, make me feel bad and frustrated. Because as wikipedia defines procrastination is counterproductive, needless and delaying. d) When the timer rings, you HAVE to have your self a 3-5 minutes rest. You can use this time for internet, making tea, or standing in front of window and pretend to be awesome philosophers. Everything but the work you are doing. c) an open mind to at least give it a try in a week. Boy, was I nervous when I try it the first time. That loud “Tick" and “Tock" intimidates me. I felt I just have to race with a short time. I feel that I will never win no matter I tried to think and type fast. 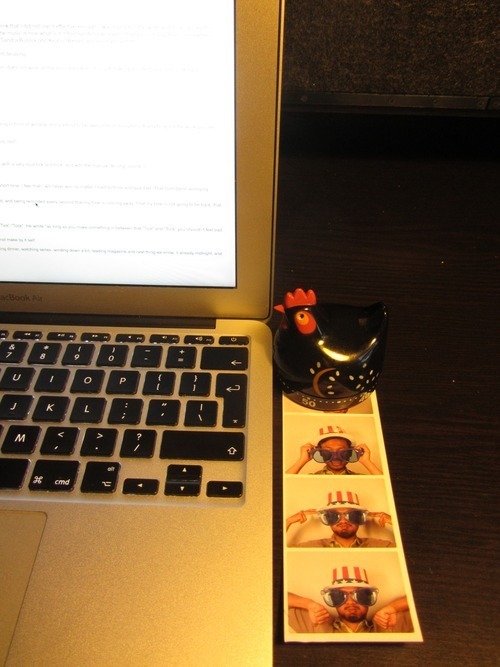 That God-damn-annoying-chicken-shape-kitchen-timer just will ring without me finishing my work. I feel like running and running, and rather than being concentrated and being very productive I felt like I was suffocated, and being reminded every second that my time is running away. That my time is not going to be back, that I will not going to be fest enough to finish my task at hand. However, like my relationship with dietary yoghurt, I give my self a second chance to let it helps me. May be there will be more than 50% of this piece that I will rewrite later. But if I did not make it in this time, it will not make by it self. Because you know, sometime time was just running without compassion. After work, looking at Facebook, making dinner, watching series, winding down a bit, reading magazine and next thing we know, it already midnight, and tomorrow awaits in matter of minutes.